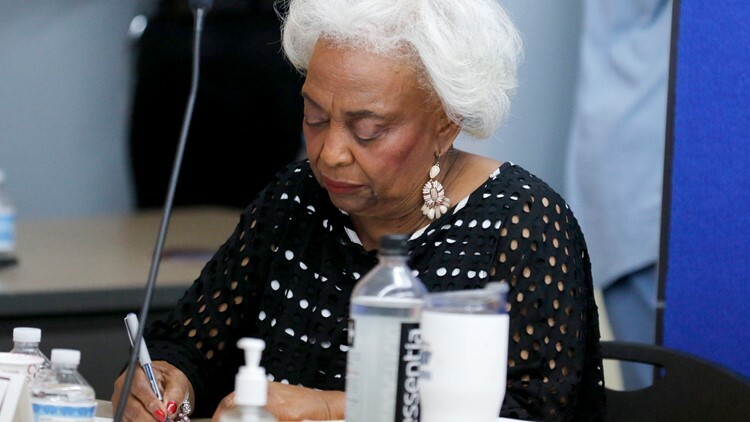 Brenda Snipes, Broward County Supervisor of Elections, signs results with other canvassing board members on November 10, 2018 in Lauderhill, Florida. Brenda Snipes says the governor's move has let her resign with "dignity." Broward County Supervisor of Elections Brenda Snipes resigned Friday, hours after Gov. Ron DeSantis reversed the suspension imposed by his predecessor that led her to rescind her previous resignation. DeSantis voided the suspension handed down by then Gov. Rick Scott, saying Friday it was time to focus on the future. “The important thing is not to throw mud about what happened in the past, but let’s get on a better footing,” he said, according to the paper. After the November midterm elections, Snipes was criticized by Gov. Rick Scott and other Republicans for a slow vote count and other problems. Snipes announced she was going to resign effective this month, but then Scott suspended her. She rescinded the resignation and filed a suit to be reinstated. A federal judge ruled Snipes was denied due process and ordered the state to give her a chance to present her case. He did not order the state to give her the job back, however.